BONUS Business Interpretation for every chapter. The first version of Sun Tzu's "The Art of War" was written more than 2,500 years ago. In the past decades, there have been hundreds of books written about the historic values, discoveries and stories on Sun Tzu and the Art of War. The first French translation was written by French Jesuit Jean Joseph Marie Amiot in 1772. Also, a partial English translation was attempted by British officer Everard Ferguson Calthrop in 1905. The first annotated English version was completed and published by Lionel Giles in 1910. The problem is... after over 100 years, we don't speak English like those people from the old days. That's why it is necessary to have a new translation from Ancient Chinese to Modern English for the digital century. This book is written in Ancient Chinese and Modern English, with BONUS Business Interpretation in each chapter. 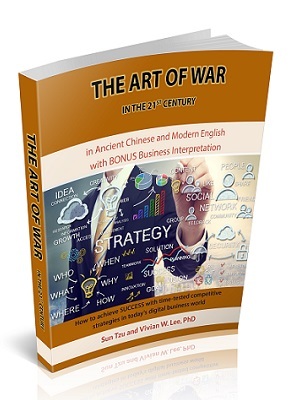 You will find ways to apply Sun Tzu's military wisdom for various Business areas, such as: Organizational Management, Human Resources, e-Business Communication, Sales Marketing, and Competitive Intelligence. You will find this book easy to read and understand. It has good word choices, simple sentence structures, and functional text layouts. You can easily read through this book in one weekend. Gain a new mindset to apply various competitive strategies, techniques and tactics in different situations for your own SUCCESS. Download a copy now to discover infinite possibilities! to get 10% discount for any digital book purchase at Global MCN Bookstore today!